Fill out the Taco Bell job application via the Taco Bell jobs website (link posted below). 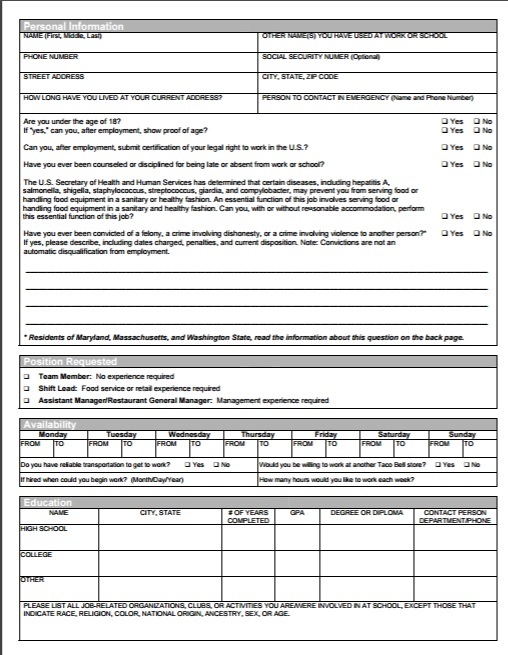 Although the official application is currently only available online, you can download the .PDF version below and submit it in-person at a location in your area. The instructional guides on this page provide an overview of the online/.PDF application processes. Note: You can use the online application to apply for multiple jobs (in more than one location). Step 1 – Go to main jobs site. Step 2 – Scroll down to the “Career Search” section, and then fill in the search criteria (job/keyword/ZIP/location). Click the “Search Careers” button to load the results. Step 3 – Press the “Apply” link of the job you’re interested in applying for. Step 4 – Review the job description, and then click the “Apply” link. Step 5 – Review the job description and then hit the “Apply Now” button. Step 6 – In order to begin the application process you must create an account. Click the “Start Here” button to load the registration form. Step 8 – Click the “Next” button to load the next section of the application. Step 9 – Continue to complete each required section of the application. You will be required to enter your employment/education histories, reference information, schedule/availability, and other relevant details. Step 1 – Download the application in .PDF format. Step 4 – Select your preferred position by checking the appropriate box. Select whether or not you have reliable transportation to work. Select if you wold be willing to work at another Taco Bell location. Enter the month/day/year that you will be able to begin working. Submit how many hours per week you would prefer to work. Fill in your education history (schools, years attended, etc.). Step 7 – Fill out the required sections of the application and then deliver it (in-person) to the Taco Bell location of your choice.